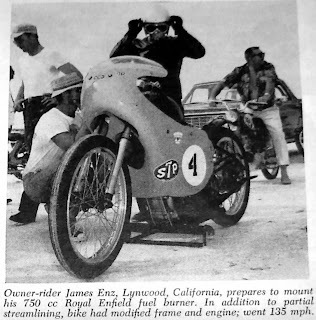 The New York Times reported that James Enz of Lynwood, Calif., set a motorcycle speed record at the Bonneville Salt Flats on Aug. 26, 1964. Fellow blogger "Stretch" dug up a period picture from Cycle magazine for his Nostalgia on Wheels blog. The picture shows Enz preparing for a run on his 750cc Royal Enfield in the semi-streamlined class. He went 135.314 miles per hour, according to The Times. I've pointed you toward Stretch's blog before. He tells us very little about himself, but seems dedicated to showing great motorcycle pictures "from a more civilized time." I question whether the outlaw-obsessed magazines of the time were more civilized. But the motorcycles are great. Take a look.